May the intercession, O Lord, of blessed Benedict, the Abbot recommend us to thee; that what we cannot hope for through any merits of our own, we may obtain by his prayers. Through our Lord Jesus Christ, thy Son, who liveth and reigneth with thee, in the unity of the Holy Ghost, God, world without end. Amen. Forty days after the white dove of Cassino [St. Scholastica] had mounted to heaven, Benedict, her glorious Brother, ascended by a bright path to the blissful abode, where they were to be united for ever. Both of them reached the heavenly country during that portion of the year, which corresponds with the holy Season of Lent. It frequently happens, however, that St. Scholastica's feast is kept before Lent has begun; whereas St. Benedict's day, the twenty-first of March, always comes during the Season of penance. God, who is the Sovereign Master of time, willed that the Faithful, whilst practising their exercises of penance, should always have before their eyes a Saint, whose example and intercession should inspire them with courage. With what profound veneration ought we not to celebrate the Festival of this wonderful Saint, who, as St. Gregory says, “was filled with the spirit of all the Just!” If we consider his virtues, we find nothing superior in the annals of perfection presented to our admiration by the Church. Love of God and man, humility, the gift of prayer, dominion over the passions,—form him into a master-piece of the grace of the Holy Ghost. Miracles seem to constitute his life: he cures the sick, commands the elements, casts out devils, and raises the dead to life. The spirit of prophecy unfolds futurity to him; and the most intimate thoughts of men are not too distant for the eye of his mind to scan. These superhuman qualifications are heightened by a sweet majesty, a serene gravity, and a tender charity, which shine in every page of his wonderful Life; and it is one of his holiest children who wrote it,—St. Gregory the Great. It is this holy Pope and Doctor, who had the honour of telling posterity all the wonders which God vouchsafed to work in his servant Benedict. And Benedict did all this by that little book, which we call his “Rule.” This admirable code of Christian perfection and prudence disciplined the countless legions of Religious, by whom the Holy Patriarch achieved all these prodigies. During the ages which preceded the promulgation of this “Rule,”—so wonderful in its simple eloquence,—the Monastic Life, in the Western Church, had produced some few saintly men; but there was nothing to justify the hope, that this kind of life would become, even more than it had been in the East, the principal means of the Christian regeneration and civilization of so many nations. This “Rule” once written,—and all others gradually give place to it, as the stars are eclipsed when the sun has risen. The West was peopled with Monasteries; and from these Monasteries flowed upon Europe all those blessings, which have made it the privileged quarter of the globe. An incredible number of Saints, both men and women, who look up to Benedict as their Father, purify and sanctify the world, which had not yet emerged from the state of semi-barbarism. A long series of Popes, who had once been Novices in the Benedictine Cloister, preside over the destinies of this new world, and form for it a new legislation, which, being based exclusively on the moral law, is to avert the threatening prevalence of brutal despotism. Bishops innumerable, trained in the same School of Benedict, consolidate this moral legislation in the provinces and cities over which they are appointed. The Apostles of twenty barbarous nations confront their fierce and savage tribes, and, with the Gospel in one hand, and the “Rule” of their Holy Father in the other, lead them into the fold of Christ. For many centuries, the learned men, the Doctors of the Church, and the instructors of youth, belong, almost exclusively, to the Order of the great Patriarch, who, by the labours of his children, pours forth on the people the purest beauty of light and truth. This choir of heroes in every virtue, of Popes, of Bishops, of Apostles, of holy Doctors, proclaiming themselves as his Disciples, and joining with the universal Church in glorifying that God, whose holiness and power shine forth so brightly in the life and actions of Benedict,—what a corona, what an aureola of glory for one Saint to have! Benedict was born of a noble family at Nursia. He was sent to Rome, that he might receive a liberal education; but not long after, he withdrew to a place called Subiaco, and there hid himself in a very deep cave, that he might give himself entirely to Jesus Christ. He passed three years in that retirement, unknown to all save to a Monk, by name Romanus, who supplied him with the necessaries of life. The devil having one day excited him to a violent temptation of impurity, he rolled himself amidst prickly brambles, and extinguished within himself the desire of carnal pleasure by the pain he thus endured. The fame of his sanctity, however, became known beyond the limits of his hiding-place, and certain monks put themselves under his guidance. He sharply rebuked them for their wicked lives; which rebuke so irritated them, that they resolved to put poison in his drink. Having made the sign of the Cross over the cup as they proffered it to him, it broke, and he, leaving that monastery, returned to his solitude. St. Benedict, or Bennet, was a native of Norcia, formerly an episcopal see in Umbria, and was descended from a family of note, and born about the year 480. The name of his father was Eutropius, and that of his grandfather, Justinian. When he was fit for the higher studies, he was sent by his parents to Rome, and there placed in the public schools. He, who till that time knew not what vice was, and trembled at the shadow of sin, was not a little shocked at the licentiousness which he observed in the conduct of some of the Roman youth, with whom he was obliged to converse; and he was no sooner come into the world, but he resolved to bid an eternal farewell to it, not to be entangled in its snares. He therefore left the city privately, and made the best of his way towards the deserts. His nurse, Cyrilla, who loved him tenderly, followed him as far as Afilum, thirty miles from Rome, where he found means to get rid of her, and pursued his journey alone to the desert mountains of Sublacum, near forty miles from Rome. It is a barren, hideous chain of rocks, with a river and lake in the valley. Near this place the saint met a monk of a neighboring monastery, called Romanus, who gave him the monastic habit, with suitable instructions, and conducted him to a deep narrow cave in the midst of these mountains, almost inaccessible to men. In this cavern, now called the Holy Grotto, the young hermit chose his abode: and Romanus, who kept his secret, brought him hither, from time to time, bread and the like slender provisions, which he retrenched from his own meals, and let them down to the holy recluse with a line, hanging a bell to the cord to give him notice. Bennet seems to have been about fourteen or fifteen years old when he came to Sublacum; St. Gregory says, he was yet a child. He lived three years in this manner, known only to Romanus. But God was pleased to manifest his servant to men, that he might shine forth as a light to many. In 497, a certain pious priest in that country, while he was preparing a dinner for himself on Easter-Sunday, heard a voice which said: “You are preparing for yourself a banquet, while my servant Bennet, at Sublacum, is distressed with hunger.” The priest immediately set out in quest of the hermit, and with much difficulty found him out. Bennet was surprised to see a man come to him; but before he would enter into conversation with him, he desired they might pray together. They then discoursed for some time on God and heavenly things. At length the priest invited the saint to eat, saying it was Easter-day, on which it is not reasonable to fast; though St. Bennet answered him, that he knew not that it was the day of so great a solemnity, nor is it to be wondered at, that one so young should not be acquainted with the day of a festival, which was not then observed by all on the same day, or that he should not understand the Lunar Cycle, which at that time was known by very few. After their repast the priest returned home. Soon after certain shepherds discovered the saint near his cave, but at first took him for a wild beast; for he was clad with the skins of beasts, and they imagined no human creature could live among those rocks. When they found him to be a servant of God, they respected him exceedingly, and many of them were moved by his heavenly discourses to embrace with fervor a course of perfection. From that time he began to be known, and many visited him, and brought him such sustenance as he would accept: in requital for which he nourished their souls with spiritual instructions. Though he lived sequestered from the world, he was not yet secure from the assaults of the tempter. Wherever we fly the devil still pursues us, and we carry a domestic enemy within our own breasts. St. Gregory relates, that while St. Bennet was employed in divine contemplation, the fiend endeavored to withdraw his mind from heavenly objects, by appearing in the shape of a little black-bird; but that, upon his making the sign of the cross, the phantom vanished. After this, by the artifices of this restless enemy, the remembrance of a woman whom the saint had formerly seen at Rome, occurred to his mind, and so strongly affected his imagination, that he was tempted to leave his desert. But blushing at so base a suggestion of the enemy, he threw himself upon some briers and nettles which grew in the place where he was, and rolled himself a long time in them, till his body was covered with blood. The wounds of his body stifled all inordinate inclinations, and their smart extinguished the flame of concupiscence. This complete victory seemed to have perfectly subdued that enemy; for he found himself no more molested with its stings. The fame of his sanctity being spread abroad, it occasioned several to forsake the world, and imitate his penitential manner of life. Some time after, the monks of Vicovara, on the death of their abbot, pitched upon him to succeed him. He was very unwilling to take upon him that charge, which he declined in the spirit of sincere humility, the beloved virtue which he had practised from his infancy, and which was the pleasure of his heart, and is the delight of a God humbled even to the cross, for the love of us. The saint soon found by experience that their manners did not square with his just idea of a monastic state. Certain sons of Belial among them carried their aversion so far as to mingle poison with his wine: but when, according to his custom, before he drank of it he made the sign of the cross over the glass, it broke as if a stone had fallen upon it. “God forgive you, brethren,” said the saint, with his usual meekness and tranquillity of soul, “you now see I was not mistaken when I told you that your manners and mine would not agree.” He therefore returned to Sublacum; which desert he soon peopled with monks, for whom he built twelve monasteries, placing in each twelve monks with a superior. In one of these twelve monasteries there lived a monk, who, out of sloth, neglected and loathed the holy exercise of mental prayer, insomuch that after the psalmody or divine office was finished, he every day left the church to go to work, while his brethren were employed in that holy exercise; for by this private prayer in the church, after the divine office, St. Gregory means pious meditation, as Dom. Mege demonstrates. This slothful monk began to correct his fault upon the charitable admonition of Pompeian, his superior; but, after three days, relapsed into his former sloth. Pompeian acquainted St. Benedict, who said, “I will go and correct him myself.” Such indeed was the danger and enormity of this fault, as to require the most effectual and speedy remedy. For it is only by assiduous prayer that the soul is enriched with the abundance of the heavenly water of divine graces, which produces in her the plentiful fruit of all virtues. If we consider the example of all the saints, we shall see that prayer was the principal means by which the Holy Ghost sanctified their souls, and that they advanced in perfection in proportion to their progress in the holy spirit of prayer. If this be neglected, the soul becomes spiritually barren, as a garden loses all its fruitfulness, and all its beauty, if the pump raises not up a continual supply of water, the principle of both. St. Benedict, deploring the misfortune and blindness of this monk, hastened to his monastery, and coming to him at the end of the divine office, saw a little black boy leading him by the sleeve out of the church. After two days' prayer, St. Maurus saw the same; but Pompeian could not see this vision, by which was represented that the devil studies to withdraw men from prayer, in order that, being disarmed and defenceless, they may easily be made a prey. On the third day, St. Benedict finding the monk still absent from church in the time of prayer, struck him with a wand, and by that correction the sinner was freed from the temptation. Dom. German Millet tells us, from the tradition and archives of the monastery of St. Scholastica, that this happened in St. Jerom's. In the monastery of St. John, a fountain sprung up at the prayers of the saint; this, and two other monasteries, which were built on the summit of the mountain, being before much distressed for want of water. In that of St. Clement, situate on the bank of a lake, a Goth, who was a monk, let fall the head of a sickle into the water as he was cutting down thistles and weeds in order to make a garden; but St. Maur, who with St. Placidus lived in that house, holding the wooden handle in the water, the iron of its own accord swam, and joined it again, as St. Gregory relates. St. Benedict's reputation drew the most illustrious personages from Rome and other remote parts to see him. Many, who came clad in purple, sparkling with gold and precious stones, charmed with the admirable sanctity of the servant of God, prostrated themselves at his feet to beg his blessing and prayers, and some, imitating the sacrifice of Abraham, placed their sons under his conduct in their most tender age, that they might be formed to perfect virtue from their childhood. Among others, two rich and most illustrious senators, Eutychius, or rather Equitius, and Tertullus, committed to his care their two sons, Maurus, then twelve years old, and Placidus, also a child, in 522. The devil, envying so much good, stirred up his wicked instruments to disturb the tranquillity of the servant of God. Florentius, a priest in the neighboring country, though unworthy to bear that sacred character, moved by a secret jealousy, persecuted the saint, and aspersed his reputation with grievous slanders. Bennet, being a true disciple of Christ, knew no revenge but that of meekness and silence: and not to inflame the envy of his adversary, left Sublacum, and repaired to Mount Cassino. He had not got far on his journey, when he heard that Florentius was killed by the fall of a gallery in which he was. The saint was much afflicted at his sudden and unhappy death, and enjoined a penance for calling it a deliverance from persecution. Cassino is a small town, now in the kingdom of Naples, built on the brow of a very high mountain, on the top of which stood an old temple of Apollo, surrounded with a grove in which certain idolaters still continued to offer their abominable sacrifices. The man of God having, by his preaching and miracles, converted many of them to the faith, broke the idol to pieces, overthrew the altar, demolished the temple, and cut down the grove. Upon the ruins of which temple and altar he erected two oratories or chapels; one bore the name of St. John the Baptist, the other of St. Martin. This was the origin of the celebrated abbey of Mount Cassino, the foundation of which the saint laid in 529, the forty-eighth year of his age, the third of the emperor Justinian: Felix IV being pope, and Athalaric king of the Goths in Italy. The patrician, Tertullus, came about that time to pay a visit to the saint, and to see his son Placidus; and made over to this monastery several lands which he possessed in that neighborhood, and also a considerable estate in Sicily. St. Bennet met on Mount Cassino one Martin, a venerable old hermit, who, to confine himself to a more austere solitude, had chained himself to the ground in his cell, with a long iron chain. The holy abbot, fearing this singularity might be a mark of affectation, said to him: “If you are a servant of Jesus Christ, let the chain of his love, not one of iron, hold you fixed in your resolution.” Martin gave proof of his humility by his obedience, and immediately laid aside his chain. St. Bennet governed also a monastery of nuns, situate near Mount Cassino, as is mentioned by St. Gregory: he founded an abbey of men at Terracina, and sent St. Placidus into Sicily to establish another in that island. Though ignorant of secular learning, he was eminently replenished with the Spirit of God, and an experimental science of spiritual things: on which account he is said by St. Gregory the Great to have been “learnedly ignorant and wisely unlettered.” For the alphabet of this great man is infinitely more desirable than all the empty science of the world, as St. Arsenius said of St. Antony. 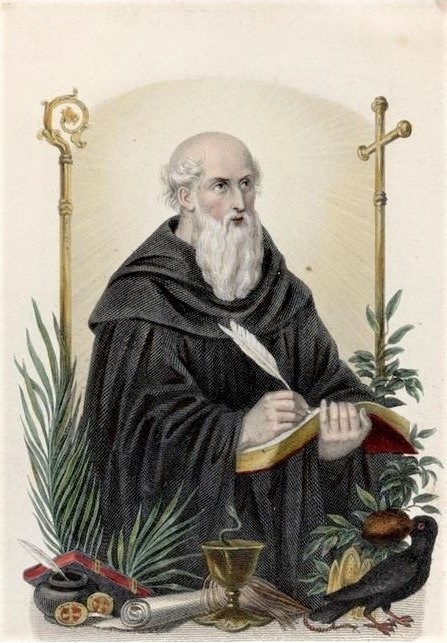 From certain very ancient pictures of St. Benedict, and old inscriptions, Mabillon proves this saint to have been in holy orders, and a deacon. Several moderns say he was a priest; but, as Muratori observes, without grounds. By the account which St. Gregory has given us of his life, it appears that he preached sometimes in neighboring places, and that a boundless charity opening his hand, he distributed among the needy all that he had on earth, to lay up his whole treasure in heaven. St. Bennet, possessing perfectly the science of the saints, and being enabled by the Holy Ghost to be the guide of innumerable souls in the most sublime paths of Christian perfection, compiled a monastic rule, which, for wisdom and discretion, St. Gregory the Great preferred to all other rules; and which was afterwards adopted, for some time, by all the monks of the West. It is principally founded on silence, solitude, prayer, humility, and obedience. St. Bennet calls his Order a school in which men learn how to serve God: and his life was to his disciples a perfect model for their imitation, and a transcript of his rule. Being chosen by God, like another Moses, to conduct faithful souls into the true promised land, the kingdom of heaven, he was enriched with eminent supernatural gifts, even those of miracles and prophecy. He seemed, like another Eliseus, endued by God with an extraordinary power, commanding all nature; and like the ancient prophets, foreseeing future events. He often raised the sinking courage of his monks, and baffled the various artifices of the devil with the sign of the cross, rendered the heaviest stone light in building his monastery by a short prayer, and, in presence of a multitude of people, raised to life a novice who had been crushed by the fall of a wall at Mount Cassino. He foretold, with many tears, that this monastery should be profaned and destroyed; which happened forty years after, when the Lombards demolished it about the year 580. He added, that he had scarce been able to obtain of God that the inhabitants should be saved. It was strictly forbid by the rule of St. Benedict, for any monk to eat out of his monastery, unless he was at such a distance that he could not return home that day, and this rule, says Saint Gregory, was inviolably observed. Indeed, nothing more dangerously engages monks in the commerce of the world; nothing more enervates in them the discipline of abstinence and mortification, than for them to eat and drink with seculars abroad. St. Gregory tells us, that St. Bennet knew by revelation the fault of one of his monks who had accepted of an invitation to take some refreshment when he was abroad on business. A messenger who brought the saint a present of two bottles of wine, and had hid one of them, was put in mind by him to beware of drinking of the other, in which he afterwards found a serpent. One of the monks, after preaching to the nuns, had accepted of some handkerchiefs from them, which he hid in his bosom; but the saint, upon his return, reproved him for his secret sin against the rule of holy poverty. A novice, standing before him, was tempted with thoughts of pride on account of his birth: the saint discovered what passed in his soul, and bid him make the sign of the cross on his breast. When Belisarius, the emperor's general, was recalled to Constantinople, Totila, the Arian king of the Goths, invaded and plundered Italy. Having heard wonders of the sanctity of St. Bennet, and of his predictions and miracles, he resolved to try whether he was really that wonderful man which he was reported to be. Therefore, as he marched through Campania, in 542, he sent the man of God word that he would pay him a visit. But instead of going in person, he dressed one of his courtiers, named Riggo, in his royal purple robes, and sent him to the monastery, attended by the three principal lords of his court, and a numerous train of pages. St. Bennet, who was then sitting, saw him coming to his cell, and cried out to him at some distance: “Put off, my son, those robes which you wear, and which belong not to you.” The mock king, being struck with a panic for having attempted to impose upon the man of God, fell prostrate at his feet, together with all his attendants. The saint, coming up, raised him with his hand; and the officer returning to his master, related trembling what had befallen him. The king then went himself, but was no sooner come into the presence of the holy abbot, but he threw himself on the ground and continued prostrate till the saint, going to him, obliged him to rise. The holy man severely reproved him for the outrages he had committed, and said: “You do a great deal of mischief, and I foresee you will do more. You will take Rome: you will cross the sea, and will reign nine years longer: but death will overtake you in the tenth, when you shall be arraigned before a just God to give an account of your conduct.” All which came to pass as St. Benedict had foretold him. Totila was seized with fear, and recommended himself to his prayers. From that day the tyrant became more humane; and when he took Naples, shortly after, treated the captives with greater lenity than could be expected from an enemy and a barbarian. When the bishop of Canusa afterwards said to that saint, that Totila would leave Rome a heap of stones, and that it would be no longer inhabited, he answered: “No: but it shall be beaten with storms and earthquakes, and shall be like a tree which withers by the decay of its root.” Which prediction St. Gregory observes to have been accomplished. The death of this great saint seems to have happened soon after that of his sister St. Scholastica, and in the year after his interview with Totila. He foretold it his disciples, and caused his grave to be opened six days before. When this was done he fell ill of a fever, and on the sixth day would be carried into the chapel, where he received the body and blood of our Lord, and having given his last instructions to his sorrowful disciples, standing and leaning on one of them, with his hands lifted up, he calmly expired, in prayer, on Saturday, the 21st of March, probably in the year 543, and of his age the sixty-third; having spent fourteen years at Mount Cassino. The greatest part of his relics remains still in that abbey; though some of his bones were brought into France, about the close of the seventh century, and deposited in the famous abbey of Fleury, which, on that account, has long borne the name of St. Bennet's on the Loire. It was founded in the reign of Clovis II, about the year 640, and [belonged then] to the congregation of St. Maur. St. Gregory, in two words, expresses the characteristical virtue of this glorious patriarch of the monastic order, when he says, that, returning from Vicovara to Sublaco, he dwelt alone with himself; which words comprise a great and rare perfection, in which consists the essence of holy retirement. A soul dwells not in true solitude, unless this be interior as well as exterior, and unless she cultivates no acquaintance but with God and herself, admitting no other company. Many dwell in monasteries, or alone, without possessing the secret of living with themselves. Though they are removed from the conversation of the world, their minds still rove abroad, wandering from the consideration of God and themselves, and dissipated amid a thousand exterior objects which their imagination presents to them, and which they suffer to captivate their hearts, and miserably entangle their will with vain attachments and foolish desires. Interior solitude requires the silence of the interior faculties of the soul, no less than of the tongue and exterior senses: without this, the enclosure of walls is a very weak fence. In this interior solitude, the soul collects all her faculties within herself, employs all her thoughts on herself and on God, and all her strength and affections in aspiring after him. Thus, St. Benedict dwelt with himself, being always busied in the presence of his Creator, in bewailing the spiritual miseries of his soul and past sins, in examining into the disorders of his affections, in watching over his senses, and the motions of his heart, and in a constant attention to the perfection of his state, and the contemplation of divine things. This last occupied his soul in the sweet exercises of divine love and praise; but the first-mentioned exercises, or the consideration of himself, and of his own nothingness and miseries, laid the foundation by improving in him continually the most profound spirit of humility and compunction. The twelve degrees of humility [Chapter VII], which he lays down in his Rule, are commended by St. Thomas Aquinas. 1. The first is a deep compunction of heart, and holy fear of God and his judgments, with a constant attention to walk in the divine presence, sunk under the weight of this confusion and fear. 2. The perfect renunciation of our own will. 4. Patience under all sufferings and injuries. 5. The manifestation of our thoughts and designs to our superior or director. 6. To be content, and to rejoice, in all humiliations; to be pleased with mean employments, poor clothes, &c., to love simplicity and poverty, (which he will have among monks, to be extended even to the ornaments of the altar,) and to judge ourselves unworthy, and bad servants in every thing that is enjoined us. 7. Sincerely to esteem ourselves baser and more unworthy than every one, even the greatest sinners. 8. To avoid all love of singularity in words or actions. 9. To love and practise silence. 10. To avoid dissolute mirth and loud laughter. 11. Never to speak with a loud voice, and to be modest in our words. 12. To be humble in all our exterior actions, by keeping our eyes humbly cast down with the publican (St. Luke, xviii. 13), and the penitent Manasses. St. Benedict adds, that divine love is the sublime recompense of sincere humility, and promises, upon the warrant of the divine word, that God will raise that soul to perfect charity, which, faithfully walking in these twelve degrees, shall have happily learned true humility. Elsewhere he calls obedience with delay the first degree of humility, but means the first among the exterior degrees; for he places before it interior compunction of soul, and the renunciation of our own will. 1. The Holy Rule of St. Benedict.